Schumann - Andante and Variations Op. 46 for two pianos, two celli and horn. Katherine Jacobson Fleisher and Alon Goldstein - pianos; Sharon Robinson and Julia Bruskin - celli; David Jolley - horn. December 2007 at the 92 street Y in New York. There is a very unique and somewhat interesting aspect to the music of Robert Schumann. This great German composer is, in my opinion, the quintessential advocate of the Romantic era. He represents so vividly what this era stood for. Maybe this fact has something to do with what I would like to bring up. It seems to me that a large number of the pieces that Schumann wrote have an immediate appeal to them - we love them from the first moment we set our "ears" on them. I think of the piano concerto, the Carnaval Op. 9, the piano quintet and the piano quartet, as well as many of his songs. However, other works remain for one reason or another, not as immediately appealing. They require further efforts by the listener as well as the performer to put before themseves a quest to unveil their beauty... their mystery. Engaging in such a quest takes time and faith, but the remuneration promises to be miraculous, especially with the music of Robert Schumann. I recently played with a great company of musicians one of Schumann's lesser known works - the Andante and Variations in B flat major, Op. 46, scored for the unusual combination of two pianos, two celli and horn. Written in 1843, this piece most likely has not been performed during Schumann's life time in its original instrumentation. 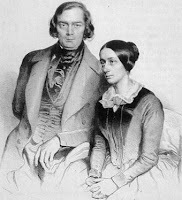 Schumann later revised it into a two piano work which Mendelssohn and Clara Schumann premiered. The piece in its original form appeared in print only 37 years after the composer's death. The eminent violinist Jaime Laredo told me that this is his favorite Schumann piece! Why is it, then, that this work still remains largely obscure? Is it merely the scoring, or are there more reasons for this? Schumann enjoyed writing pieces for unusual combination of instruments. Most of these works, though, came several years later - the Adagio and Allegro Op. 70 for horn and piano; the Concert piece Op. 86 for four horns and orchestra; the Romances Op. 94 for oboe and piano are all but a few. The Andante and Variations Op. 46 of 1843, came just after his two chamber masterpieces - the Piano Quintet Op. 44 and the Piano Quartet Op. 47. At the time Schumann preoccupied himself with writing his grandest piece to date - the oratorio Das Paradis und die Peri Op. 50. A fundamental notion of the romantic era proclaims that creative work is the result of the artist's unbounded imagination. There is also a belief that the artist is merely a vehicle taking dictation of music that arrives from another world. When we examine closely the Andante and Variations Op. 46, one of the first things which we ought to ask ourselves is about the unusual scoring. The "Two-Pianos" medium was already used before in wonderful works by Bach and Mozart among others. In this work, the dense and complex texture of the two pianos is being enriched with the low and dark colors of the two celli and the horn. Playing through the piece for the first time, it is quite surprising how sparsely these other instruments are being employed. For the most part they don't get to play the melodic lines, nor do they provide the bass line, as their register might suggest. They add, though, a unique deep dark color in the background, and also in the foreground as the piece progresses. The opening line sets the color palette. Then the curtain rises upon the theme along with a series of variations, which are more like lyrical miniatures - the first with tender lyricism, while the second with whimsical wit. Thereafter comes the third variation with the soaring melodies followed by the one overdosed with fiery energy. Sudden changes of mood are so much part of Schumann's music, and this piece is no exception. The composer's alter-egos, the demonic Florestan and the dreamy Eusebius, make their subtle appearances. Sweetness mixes with doubt, triumph with despair. Half way through the piece a miraculous moment - Schumann is quoting himself: the opening of his beloved song cycle Frauenliebe und leben. Interestingly this is the only variation in the entire piece that starts without either of the pianos. For the most part, this variation is devoted solely to the two celli and horn. It is as if Schumann is in such profound state of internal serenity that he abandons completely the richness of the pianos, allowing us to simply engage our ear with the color of the moment, with the help of the other instruments. Is this the moment of Love? ...probably. A sudden enlightenment - with the quotation from his song, maybe Schumann is writing here something similar to his good friend Mendelssohn's "songs without words". Should we then call this piece "Variations without words"? Oh, I like that!! After this magical moment the theme re-enters in its pure naked form, and then takes a slight turn into its most painful transformation. The "love" of the previous variation is inflicted with the "pain" of this one. Love and pain go hand in hand. Whether helpful or not, necessary or superfluous, Schumann's deep love to Clara must have had something to do with these varying emotions. Speaking of Mendelssohn... he now makes an appearance in the next variation, dressed up as one of his forest creatures. Though this variation is somewhat of a technical "tour de force", it is the pizzicato in the strings that draw my attention. It is in those subtleties that the piece becomes such a jewel. Then the horn gets center stage with vigorous calls that hardly ever been used in chamber music before. And in the next variation one of the clowns from the commedia dell'arte, possibly Harlequin, enters gently. By now we have traveled quite a bit and we reach the grandest of all the variations, the one that uses all the forces which are at our disposal. We become a full orchestra. This is the only variation that begins in the minor key (g minor) and both melodically and rhythmically gets more intricate as it progresses. It culminates in the "coronation" of B flat major, the home key of the piece. There is high drama and passion in this variation, a real confrontation. Eusebius returns. He gets the last word, as if to send us back to "Fantasy-land", a place we should have never left. I want to play the piece again. I want to listen to it again, now from a distance. Were these Schumann's internal thoughts or were these mine? ours? Unusual yet seductive. Appealing yet ambiguous. I feel I just added a new pearl onto my collection - one that is rougher possibly from being out of site, and at the same time serenely beautiful and uniquely shaped from being discovered and loved by not so many. I know that Schumann has more of these pearls.... Can I recommend one more?...go and listen to the Six Etudes in the form of Canons Op. 56. Variations without words - I'll always think of the piece that way from now on. A side effect of these pieces having a less immediate appeal is that they are more difficult and elusive to play - we're lucky to have people like you to play them. And write about them!